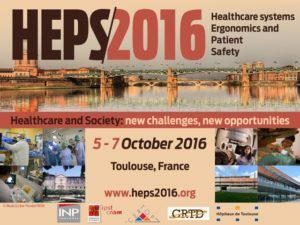 HEPS conferences seek to gather all scientists and practitioners from the Human Factors/Ergonomics (HFE) and from the healthcare worlds to share experience and knowledge on healthcare systems performance, on healthcare professionals’ well-being and on patient safety. This 5th edition will focus on the place of healthcare in our societies as well as on the challenges and opportunities that evolutions in societies offer to healthcare organizations. It will consist of invited lectures, oral presentations, symposiums, round tables and posters. We very much look forward to seeing your submissions and to meeting you in Toulouse next year. Vanina Mollo, PhD, assistant professor in ergonomics at the Polytechnic National Institute, and member of the Research Centre on Work, Organizations and Policies. V. Mollo conducts research in patient safety and on organizational models for ensuring quality of life of patients with chronic diseases. She also conducts health care training programs on occupational risk assessment and management, and on Human and Organizational Factors of healthcare safety. V. Mollo is a member of the HEPS Steering Committee. Pierre Falzon, Professor of Ergonomics at the Conservatoire national des arts et métiers (Cnam), Director of the Research Center on Work and Development. P. Falzon led or conducted research regarding patient safety (in radiotherapy, oncology, anesthesia) and the organization of the care process (outpatient, workflow). Former president of the IEA, he is the current president of the HEPS Steering Committee. The University Hospital of Toulouse, represented by Martine Servat (MD, Director of the medical strategy), Frédérique Decavel (Head coordinator of healthcare), and Anne Raspaud (PhD, Ergonomist engineer).